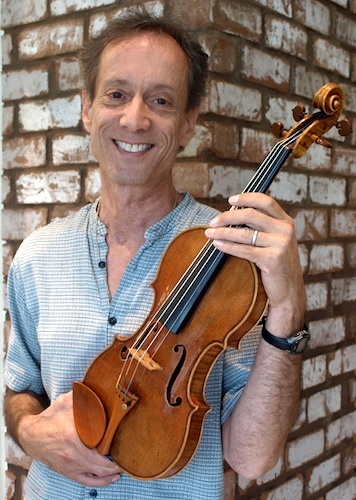 November 25, 2014, 10:55 PM · Though the basic form of the violin has not changed much in the last 400 years, the culture of violin-making has undergone a radical shift in the nearly 40 years that luthier Terry Borman has been making violins and related instruments. "It's changed a lot," Borman told me over lunch in Indianapolis, at the Violin Society of America's convention earlier this fall. "Twenty-five years ago, makers were fairly secretive. Maybe if you were working in their shop -- maybe they would talk to you about certain things. But even sometimes they would only give out certain bits of information. That has slowly evolved so that now, people are, for the most part, providing as much information as they can to others." For its part, the Violin Society of America sponsors an annual summer workshop for makers at Oberlin College -- a kind of continuing education summit that brings together luthiers from around the globe to study advanced violin and bow making, restoration, repair, acoustics and set-up for fine stringed instruments. The spirit of sharing information extends to the society's conventions and to other meetings of luthiers around the world. "Makers are finding that, aside from the fact that it's one of those feel-good things, it comes back to you many-fold," Borman said. "By the time one idea has been churned around by 15 other makers, who have found 15 other opinions of doing it -- maybe some of them are brilliant ideas and some of them are not-so-great, but at least you have the option to pick through them. It's dramatically altered the landscape. It's more of a camaraderie (now), as opposed to -- it was almost like a sect." Borman began his career in France, first repairing electric guitars, and moving on to Flamenco guitars. "I ended up getting an apprenticeship building lutes and Baroque instruments, way out in the country in a little town of about 500 people," he said. He then moved back to the U.S. and went to the Violin Making School of America in Salt Lake City. With the recent explosion in sharing information among makers, many have found niches as specialists in various aspects of violin-making: varnish, acoustics, etc. Borman's path led him to the scientific study of wood density and ultimately to an intense exploration of the mystery: Were the classic Cremonese violins by Stradivari and others made from special wood from the "Mini Ice-Age" that can't be replicated today? The techniques that he and others perfected in doing this research also led them to start a business called Instrumental Insight, which provides potential buyers of high-end instruments with comprehensive instrument condition analysis reports based on CT scan, dendrochronology, and UV varnish analysis. From this they can detect past repairs, patches, varnish touch ups, arch distortion, etc., as well as date the instrument. They did such testing on the record-high-priced 1741 "Vieuxtemps" Guarneri del Gesù before its sale; it is the violin now played by Anne Akiko Meyers. The whole idea of testing violins scientifically for wood density began in 2004, when Kyung Wha Chung commissioned Borman to create an exact copy of her violin, the 1735 ex-Rabin's ex-Kubelik, Ferni Guarneri del Gesù. Borman sought to find out as much as he could about the violin. "I decided, the easiest way to get a whole bunch of information was to just do a CT scan," Borman said. "I did get a lot of information, and that's when I started to realize I could use that information to check densities and things like that," Borman said. Specifically, he wanted to compare early and late growth in spruce; that is, the early spring growth, during which the tree has a big growth spurt, and winter growth, when it slows and produces the dark-colored grain lines and much higher-density wood. The problem was, he couldn't seem to repeat the test and get consistent results on the same piece of wood. "I'd give somebody a section and say, 'You test it,' and then I would test it, and then somebody else would test it, and we would all have different numbers," Borman said. While in the midst of trying to work out this problem in the research, "I ended up reading a copy of Investigative Radiology. There was an article in there from a Dutch researcher, Berend C. Stoel, talking about the same problem he was having using CT scans to study emphysema: repeatability of density measurements. So I sent him an email and asked, 'Hey, do you want to work with violins?' I didn't even expect to get a response, but I got an e-mail back, 'Sure!' and we've been partnered in on this ever since. He's even written special software. It's extremely repeatable at this point." The next step was to take the results and compare old Italian violins with newly-made violins, and that's when their results started challenging some popular modern notions, specifically a theory popularized by National Geographic, that Stradivari's violins were superior due to the density of the wood he used, wood that grew more dense due to "Little Ice Age," a sharp dip in temperatures in Europe that peaked between 1645 and 1715. The results of that work were published in PLOS One in 2008. In a second study published in October 2012, Borman, Stoel and Ronald de Jongh compared 18 European instruments built before 1750 and 12 “modern” ones built within the past 50 years, using CT wood densitometry to study the differences density. Their conclusion? "Stradivari and Guarneri del Gesù did not choose, or have access to, wood significantly different in density than contemporaneous or modern makers." "Nobody uses high-density wood," Borman said. "Basically our first article dubunked the whole theory of the 'Little Ice Age,' that it was higher-density wood, it was slow-growth, way-way up in the mountains, and you can't get that wood any more. What we found is that it was actually less-dense wood." Density is a mixture of volume and weight. Comparing a piece of lead that is a square centimeter and a piece of foam that is a square centimeter, each would displace the same amount of water when fully immersed, so the volume is the same. But the weight is very different, making them each a different density. "What we found is that makers today can access wood with similar material properties," Borman said, "so basically, let's just move on to something else" to another theory about Stradivari. How about the theory that wood gets lighter -- less heavy -- as it ages? "The general consensus amongst people who have studied wood their whole professional careers is that most woods become a little bit less dense, but it's not a huge difference," Borman said. When violin makers buy wood from a dealer, they know to test it for its density. "They sell wood that you pick it up and it feels like it's lead, and you pick up some other pieces and it feels like foam." In Borman's research, "we did not find a classical Cremonese instrument that was over .40 grams per milliliter -- most of them were closer to roughly .37, between .35 and .38, something like that." "The dealers are starting to catch on, that makers want to know this information, so sometimes they are starting to write the density on the blocks of wood," Borman said. "But I've checked some of those measurements, and they're wildly off, and interestingly, they always go lighter! But after you've picked through a lot of wood, you kind of get an idea, you can kind of tell from picking it up." "When I go to a dealer, I just ask them for a bucket of water," Borman said. "You slowly lower the wood into a bucket of water (and float the wood). Then you pull it out, and you mark with a pencil the line between the wet and the dry. Then you turn it around and do the same thing, you do the same test twice. Then you average those measurements, divided by the length. Basically, you're measuring the buoyancy. So if it's really heavy it's going to sink farther into the water." "We've done super high-tech stuff, and yet we get pretty close measurements with a bucket of water," Borman said. "It's nice to be able to test it, to verify that the things the typical maker has access to, provide pretty good information." November 26, 2014 at 08:53 AM · That's a beautiful looking violin. November 26, 2014 at 04:40 PM · I believe that both the one he is holding and the one pictured in the CT scanner were made by him. November 26, 2014 at 10:48 PM · That would be 0.40 g per cc, NOT per liter. Off by a factor of 1000. November 27, 2014 at 03:00 AM · Thank you for including violin makers among those you interview. Who knows? Their comments may more lasting than those of even the best players, as their instruments can last hundreds of years. November 27, 2014 at 06:04 AM · Apologies, I will change it to "milliliter"! November 29, 2014 at 04:53 PM · I found the article packed with a lot of good information which I will be able to use not only in violin making but in other endeavours. Thank you for the post.